Use this vanity to bring more traditional style into your bathroom. With a white marble counter and white solid wood base, this product is good-looking and useful. Redo the style of your bathroom with this classic from Avanity. Designed with a traditional style and strong build, this vanity is a perfect choice for any bathroom. Its beautiful beige tan marble counter and white solid wood base bring a great new look into your bathroom. Soap, towels, cleaning supplies, and other bathroom items have a home in the double-door cabinet of this vanity. This set from Avanity is great for anyone looking for great style and function in their bathroom. Designed with a traditional style and strong build, this vanity is a perfect choice for any bathroom. With a white marble counter and brown solid wood base, this product is good-looking and useful. Put a nice touch on your bathroom's look with this vanity set from Avanity. If you want a vanity that is both stylish and useful, this traditional vanity is perfect. The good-looking white marble counter and white plywood base make a big difference in your bathroom. Soap, towels, cleaning supplies, and other bathroom items have a home in the single-door cabinet of this vanity. Make your bathroom look like new with this good-looking, useful set from Bellaterra. 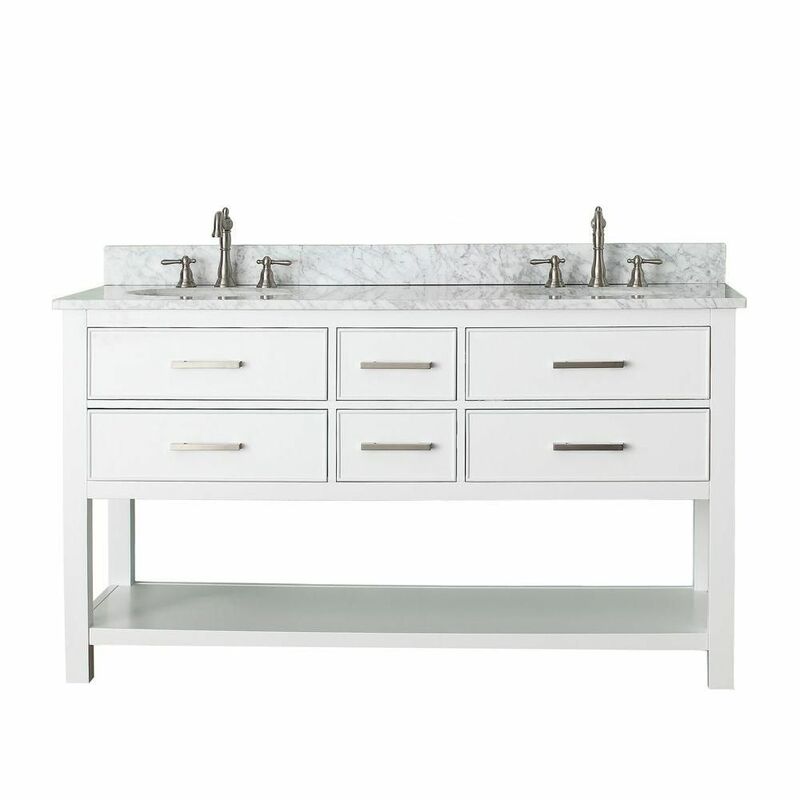 Berkeley 61-inch W 4-Drawer Freestanding Vanity in White With Marble Top in White, Double Basins Use this vanity to bring more traditional style into your bathroom. With a white marble counter and white solid wood base, this product is good-looking and useful. Redo the style of your bathroom with this classic from Avanity. Berkeley 61-inch W 4-Drawer Freestanding Vanity in White With Marble Top in White, Double Basins is rated 5.0 out of 5 by 2. Rated 5 out of 5 by Cottage from Vanity is exactly as described. I had concerns about shipping and damage but the piece was ext... Vanity is exactly as described. I had concerns about shipping and damage but the piece was extremely well packed. I purchased this for a new bathroom and even my contractor was impressed with the quality of this piece.